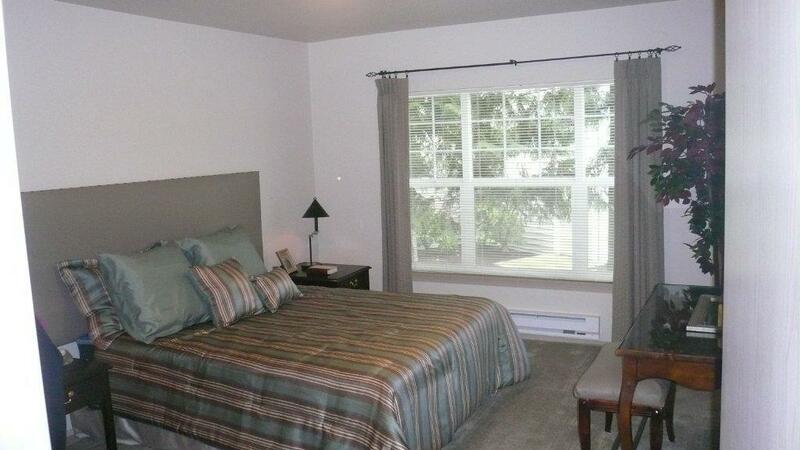 The first room is a bedroom in a model home. 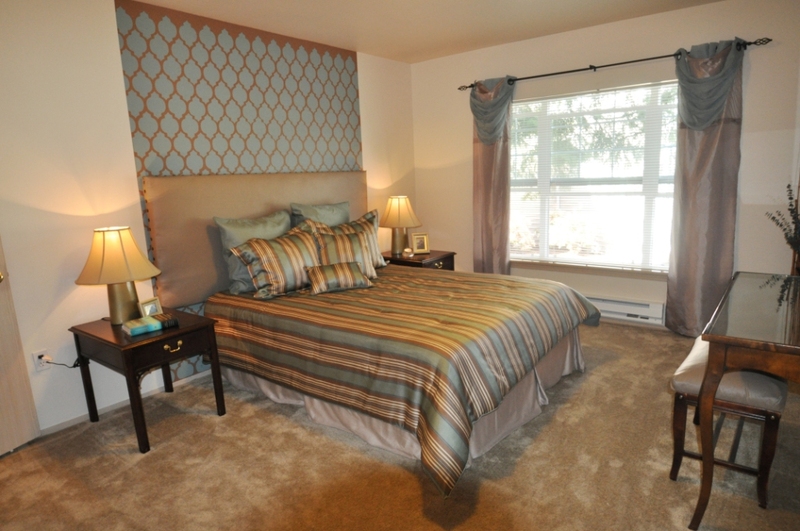 I am about to publish a post on that entire project providing tips for staging to sell, so stay tuned. 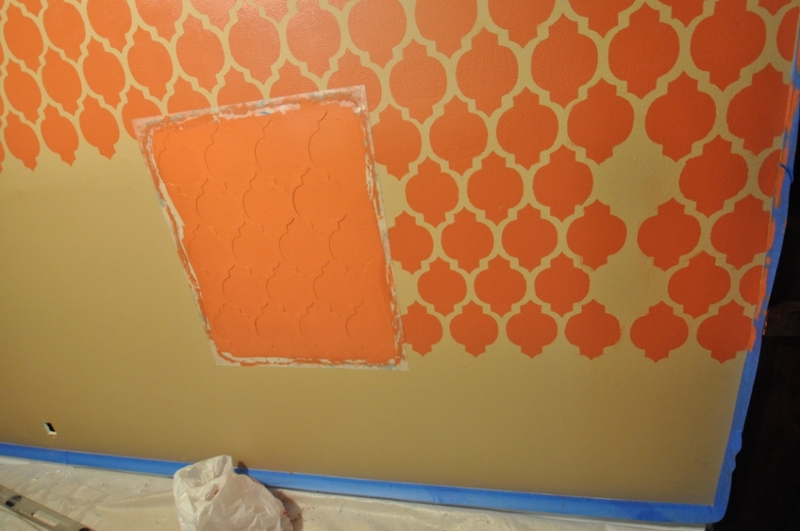 Stencils are great for accent walls. 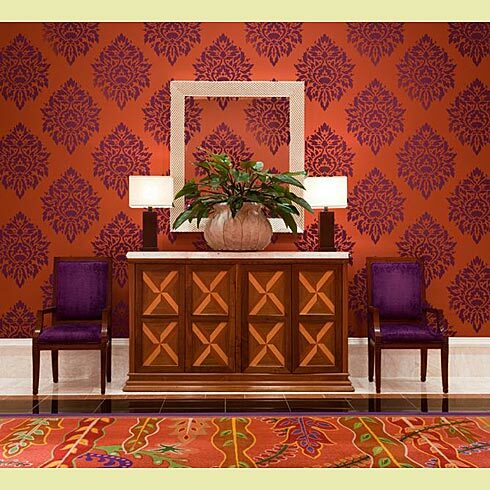 Typically you wouldn’t want to put a bold design on more than one wall in a room. Not only that you save time by only creating one accent wall. 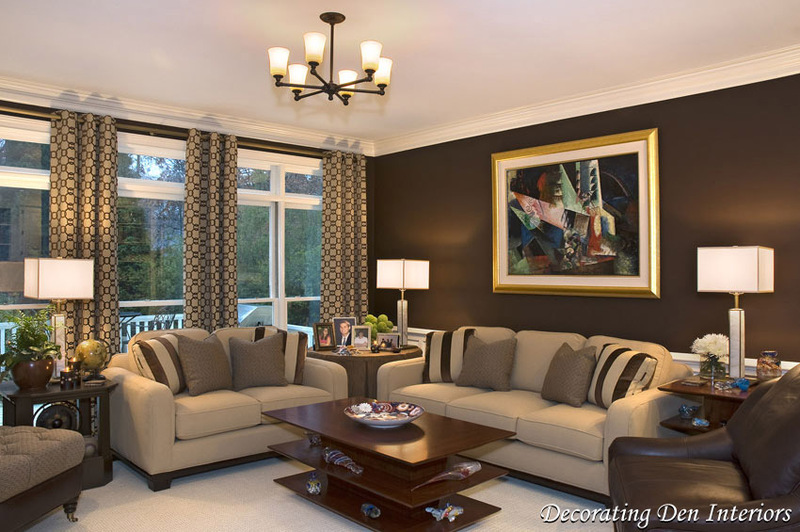 Additionally a single accent wall can really create a great focal point in a room, adding an amazing WOW factor! Notice the added drama created by the vertical stripe behind the bed above, and how it makes the ceiling appear taller as well. 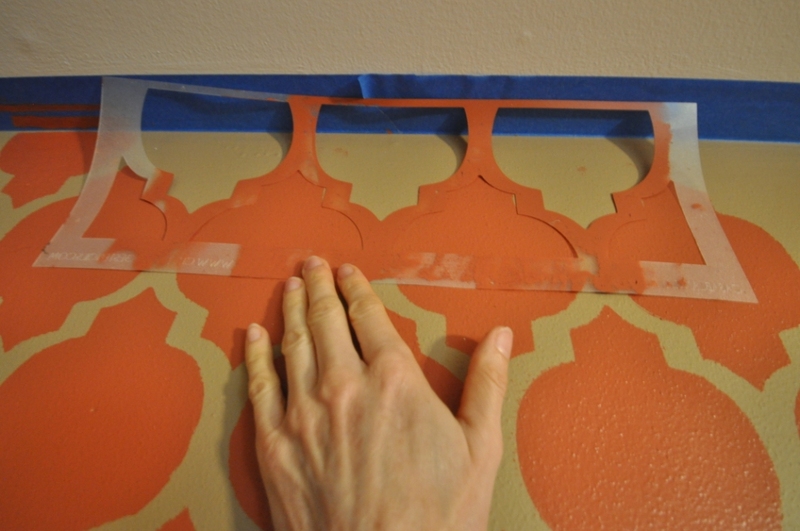 Painting the stencils on top of the stripe adds a creative dimension, and replaces the need for artwork on the wall. Also when you tire of the look, all you need to do is paint over it. Below is the same stencil which is called the Casablanca All Over stencil that you can purchase online from www.cuttingedgestencils.com. Cutting Edge Stencils has many impressive stencil designs and styles. I love the look of these layered stencils. Below they were used on artwork, but this same concept could be used in stripes painted floor to ceiling on a wall. 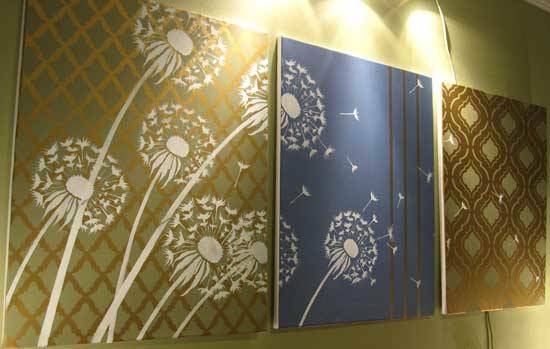 Below is an example of a more traditional look created by a damask stencil from Cutting Edge Stencils, which also will be given away by the Fusion TV show. Like the Fusion Facebook page for upcoming details on this stencil giveaway. 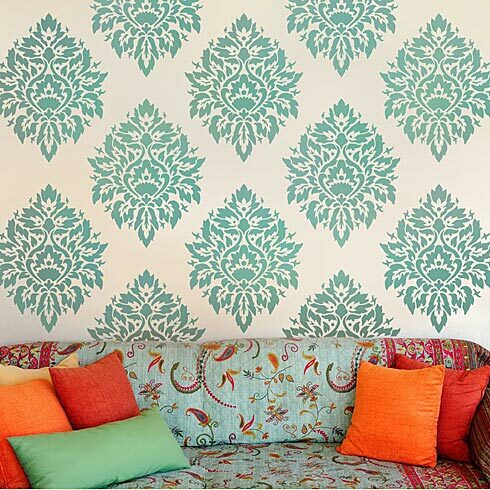 This 24″x30″ Nadya Damask stencil is included in the giveaway, and normally sells for $39.95. 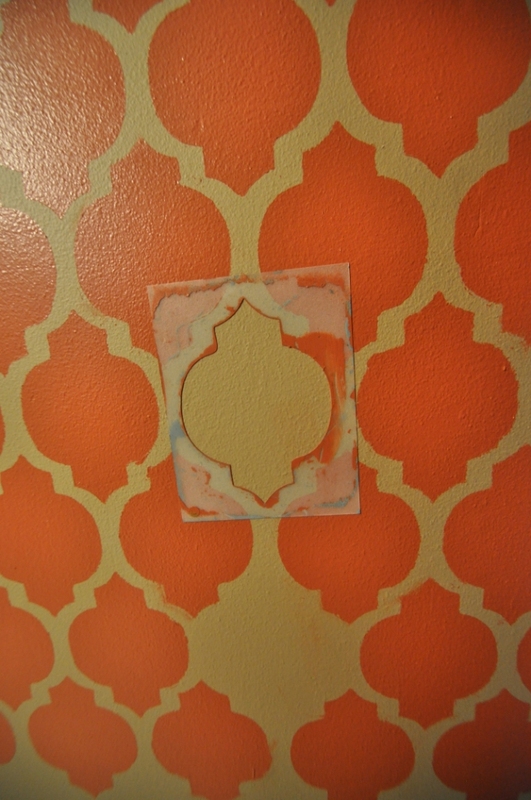 The great thing about using stencils is that you can always paint over them if you make a mistake. 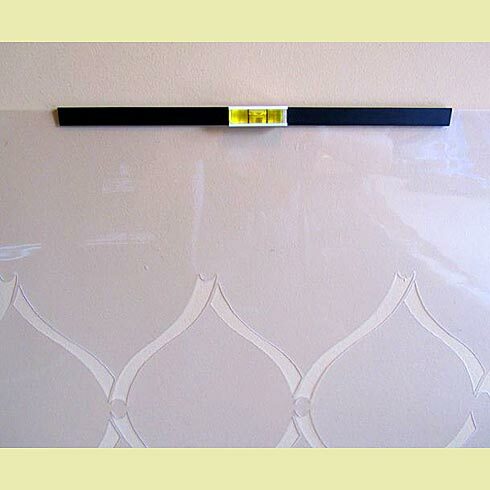 It is a bit more work than using wallpaper, but you can save a few hundred dollars. 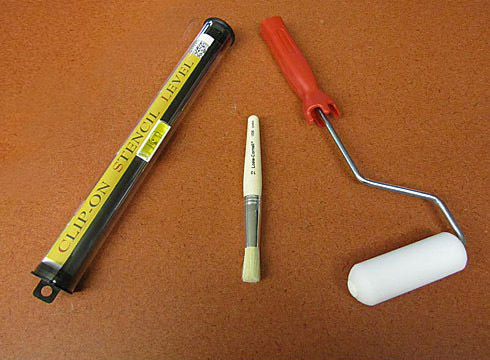 Essential stenciling tools available at http://www.CuttingEdgeStencils.com . This edge stencil came with the main stencil and allows you to fill in the edges. I smudged some stencil lines a little when I started to work too fast and didn’t blot my roller enough on a paper towel (see video instructions). However, I was able to quickly clean up the lines with a smaller brush. The key is to take your time, and don’t pressure yourself to get it done too quickly. If you’d like more tips and ideas for accent walls, check out my posts Accentuate with Accent Walls and Tips and Trends in Wallpaper and Accent Walls. A DIY post is on the way covering how the day bed was made, as well as the bulletin board in the small home office makeover. Subscribe to this blog and “Like” us on Facebook for notifications. Leave a comment on this post with your idea of how you would use the stencil design. For additional entries mention this giveaway on Facebook, Twitter, Pinterest, or your blog, and leave a comment on this blog for each post. You will win an extra chance to win with each post, but be sure to leave a separate comment for each. Contest is open to US and Canada residents, and ends Sunday June 10th at midnight, PST. One winner will be drawn at random and announced on Monday, June 11th. I LOVE the Casablanca pattern. Although I like the contrasting colors, I’m more of a minimalist and tend to lean toward the monochromatic and instead play with texture. I would love to use this stencil with a high-gloss paint over a matte wall for a surprise contrast in the right lighting. I like that affect too… I have done with that with stripes in a hallway in my home, and it makes the ceilings appear higher. 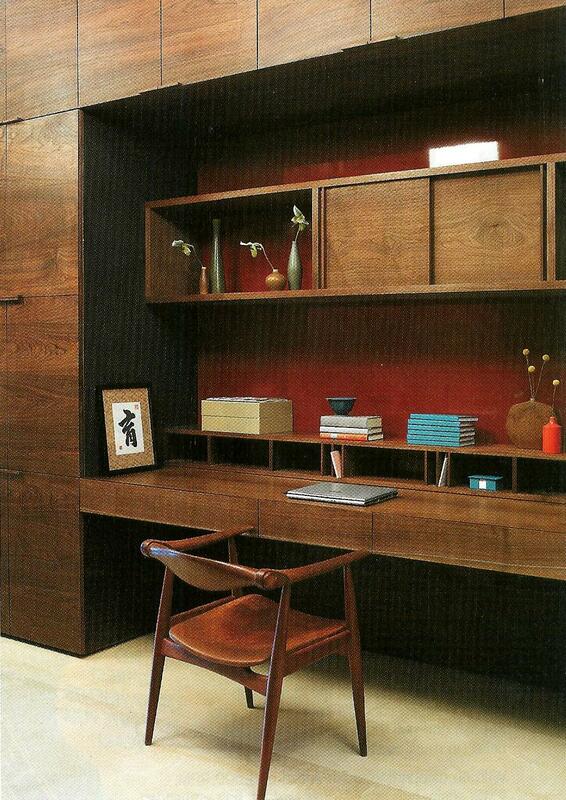 Yes it is great for the Mad Men look… I’ve just started watching that show and love it! I can’t wait to use the Casablanca pattern in my entirely red bedroom. There is a large plain red wall that has been bothering me since we moved in because it is so bare, but I didn’t know what I wanted to do with it. As soon as I saw pictures using this stencil I knew it was the answer to my dilemma! 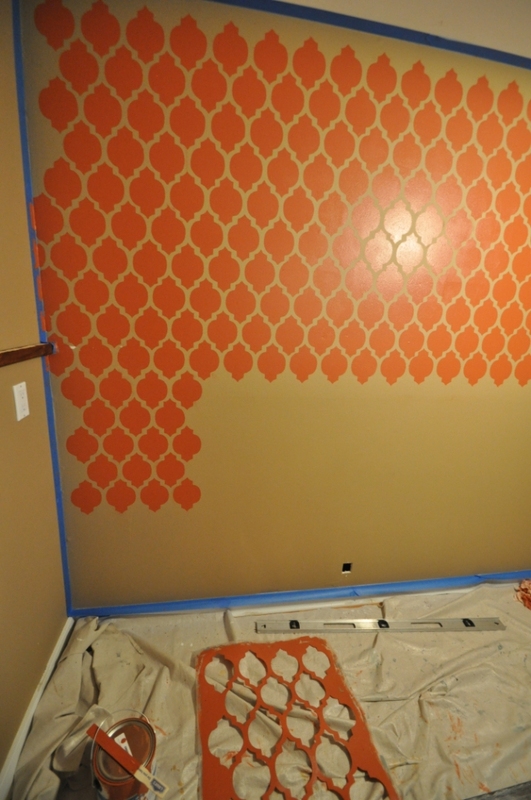 The stencils are a great way to fill up wall space! I love, love, love these stencils. I am working with our really ugly concrete slab in our backyard, and it would be very cool to ‘liven up’ the grey concrete with some color. It will look like a cool outdoor carpet. 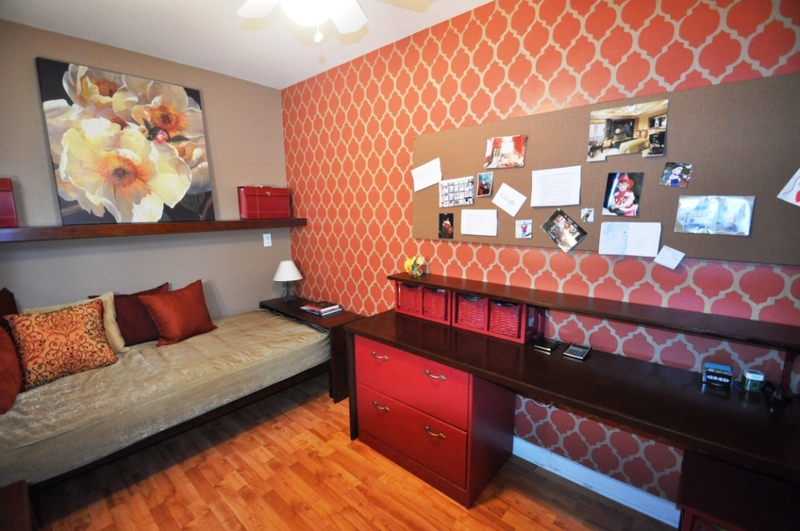 WOW, I just loved the bedroom makeover and the stencils are simply awesome. Thank you for the compliment!… Just so you know, the drawing took place in June. I love this concept of using wall stencils. Really a great and affordable way to add freshness to a room. Would love to makeover my bedroom with a wall stencil. Thank you for your comment…. Just so you know, the drawing took place in June. I have this awesome red bathroom that I have been envisioning the dandelions breezing up the walls and I would love to layer the dandelions over the Casablanca stenciling in my bedroom. Have to choose one room! That sounds fun… Would love to see a photo!